Welcome to WeAllSew and the fifth day of the Love My Scarf Blog Tour! If this is your first stop on the tour, be sure to visit the other sites by clicking on the links at the end of this post. Everyone’s scarves are fabulous, and so easy that anyone can make them. Pick one (or more!) 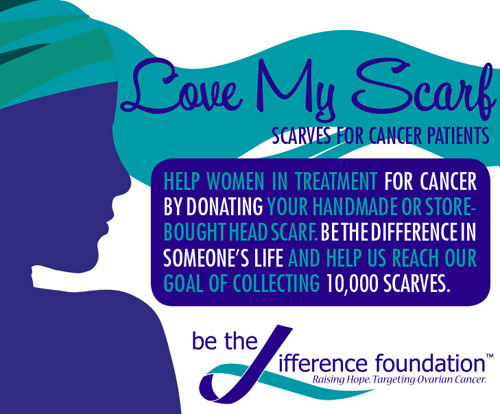 of your favorites, make a few scarves, then drop them in the Love My Scarf bin at a participating sewing machine store (or send them to the Be the Difference Foundation, address below). Designs in Machine Embroidery is sponsoring the tour, and our goal is to collect 10,000 head scarves (knit, sewn, crocheted, etc.) 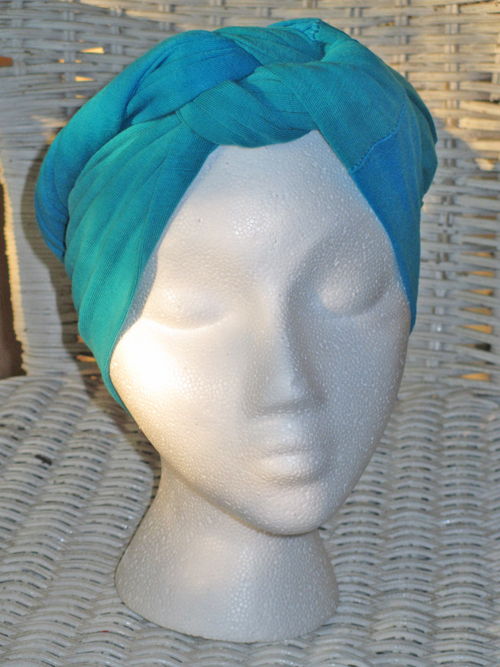 for women who are undergoing treatment for cancer and have lost their hair. Nearly all of us have a relative or friend who’s undergone cancer treatment and lost their hair, or have had the experience ourselves. (A quick shout-out to my awesome cousin Karen, a breast cancer survivor!) Making and donating a scarf is a wonderful way to show your support for women going through an especially stressful time. Imagine receiving a scarf and knowing someone made it just for you – without even knowing you! What a nice way to feel wrapped in love and support. One of my passions over the last year or so has been creating things from upcycled apparel, particularly items I can make on my overlocker/serger. So when asked to participate in the Love My Scarf Blog Tour, I knew I had to do something from old t-shirts – is there anything softer or more comfy than a well-worn cotton tee? I’m scarf-tying-challenged, so I also wanted my scarf to be something very easy to wear, and if it could be worn in different ways, that would be better still. I decided to make a long, rectangular scarf, one that could easily be wrapped and tucked around the head to protect a delicate scalp, or tossed around the neck on chilly evenings (or in overly air-conditioned rooms). I dove into my stash of deconstructed t-shirts and pulled out a few of my favorites. (Did you see Luke’s post on deconstructing men’s shirts? I do the same thing with old t-shirts.) Then I remembered a lightweight red knit dress I’d acquired last winter from a prices-slashed-to-almost-nothing rack at a department store – cotton/spandex that caught my eye because I loved the color, and bought because I loved the feel and drape…and because it was only $3. So I decided to make TWO scarves – one color-blocked, one plain. For constructing my scarves I used a two-thread flatlock on my overlocker. 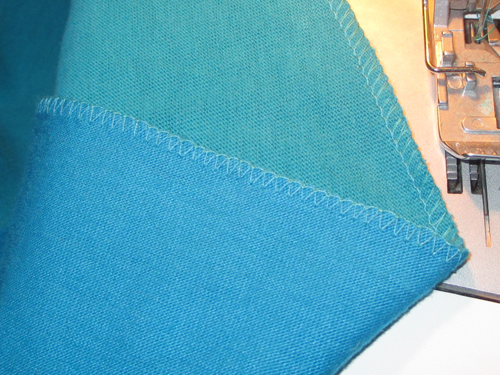 The flatlock stitch makes a lightweight seam that doesn’t have any ridges that could be irritating to sensitive skin. 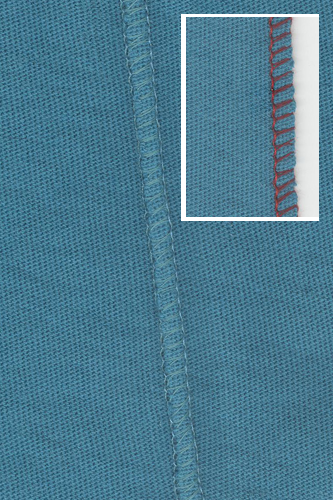 Here’s how the flatlock stitch works: Two fabrics are placed together and flatlocked along the edge. When the two pieces are gently but firmly pulled away from each other, the edges fold flat and are encased in the stitching. The seam looks “loopy” on the outside and like “ladders” on the inside. For the smoothest seam, I placed my fabrics right sides together so the ladders would end up on the right side of the fabric. To finish the ends of the scarf I stitched across the ends with the same stitch, this time using it just for decoration rather than to join two pieces together. The ends could also be left raw, as the knit fabric won’t ravel. I folded the long strip right sides together, matching the edges and seams, then flatlocked the long edges. 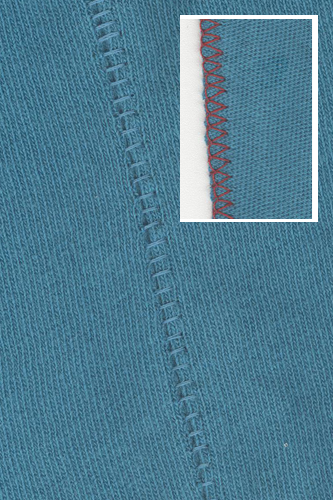 After pulling the seam flat, I turned the strip inside out, exposing the right side of the knit stripes and the ladder side of the stitching. Done! I wrapped my scarf following the excellent step-by-step and video instructions for the “Knotted & Nautical” scarf at scarves dot net. 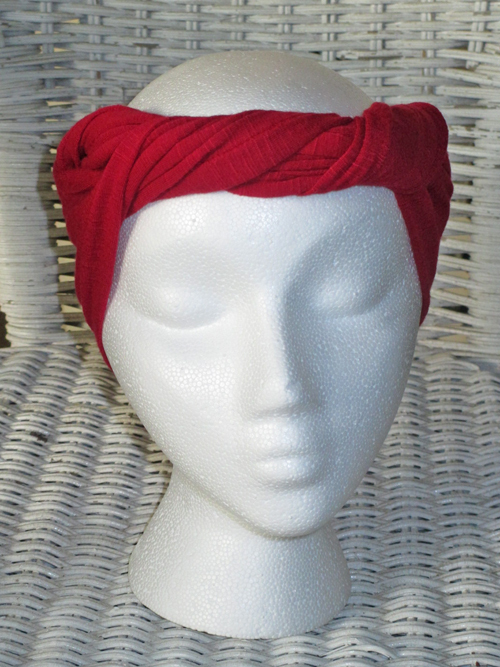 The red scarf was even easier to make. I cut a strip 14″ wide and as long as possible, which was about 42″. I left the short edges raw, folded the strip right sides together, and flatlocked the long edges together. Then pulled the stitches open and turned it right side out. It took longer to cut the fabric than to make the scarf! 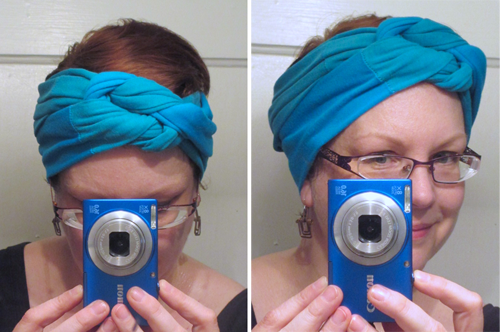 So – This was really easy to make, but did it end up being simple enough for me to tie all by myself? Yes! And it’s comfortable, too. Bonus: It’s a fabulous neck scarf, just right for cool nights. 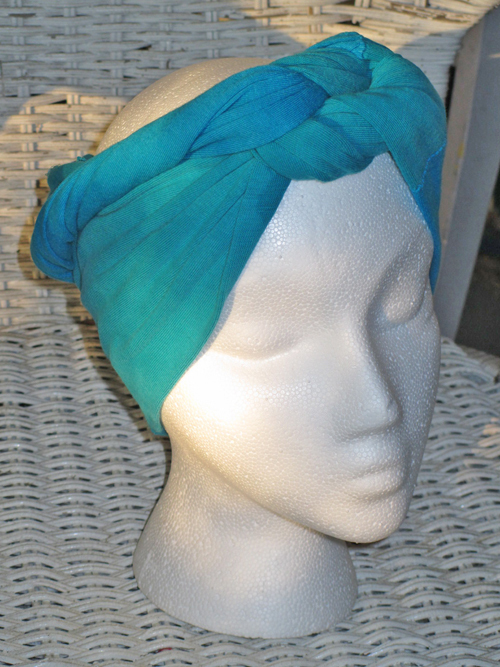 I’ll be making more of these, some to give away, and one or two for myself to wrap on bad-hair days. Have you decided what type of scarf to make? You know, it doesn’t take much longer to make two or three than to make just one, especially if they’re exactly the same. Why not make several, keep one for yourself, and donate the others? We have a give-away! Two lucky winners will each receive an Embroider-A-Cure machine embroidery collection CD from Designs in Machine Embroidery. To enter, leave a comment telling us about your favorite scarf project. Better yet, tell us about the scarf you’re making to put in the Love My Scarf collection bin! We’ll collect comments/entries until the end of the tour, Tuesday, September 4, 11:59 p.m. Central Time, then pick two winners at random. Thanks for your participation! 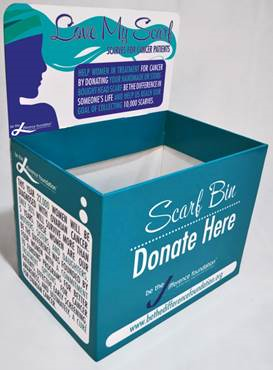 If you don’t find a Love My Scarf collection bin in your area, you may mail them to Be the Difference Foundation, 2517 Manana Rd., Dallas TX 75220. I love this and can’t wait to try to make one! My favorite scarves are the endless ones. I will be making some scarves for Porter Hospital since the ladies undergoing treatment will appreciate the gesture. I will be making scarves for a recently diagnosed person I know and will donate to the bins as well. 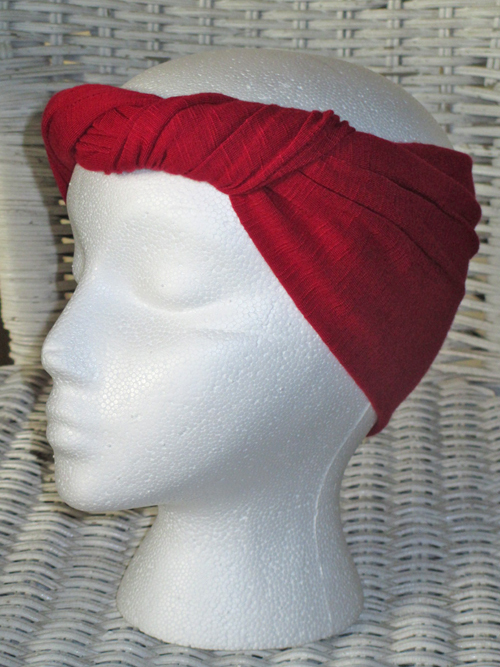 Favorite scarves are do-rags. But all on this blog tour have been inspiring. 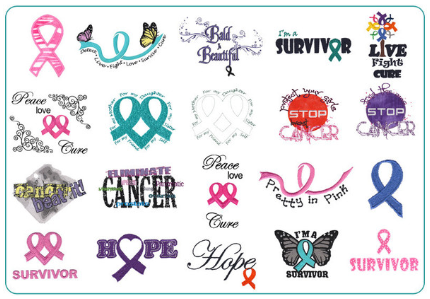 I am making embroidered scarves in honor of my friend who beat ovarian cancer. However, after seeing these T-shirt scarves, I may have to make some of them!